Lifewater’s Uganda water projects are attracting attention from the national government. The government’s recognition is affirmation that Lifewater is not only reaching more people, but reaching them more effectively and sustainably than ever before. By sharing the strategy and case study in the report (see page 166), more communities and organizations can employ the strategy to help serve more of the rural poor in Uganda. 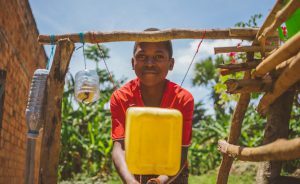 According to the report, only 70% of Ugandans living in rural areas have access to safe water (with 85% of water points functioning properly), and just 35% of schools have access to a handwashing facility. Lack of safe water, sanitation, and hygiene continue a cycle of poverty and illness, while increasing access not only ends the cycle, but promotes educational, economic, and social growth. This is especially true for women and girls, who are helped the most by improved access to water, sanitation, and hygiene. Specifically, the Government’s report highlights the VHV strategy, which pulls together the best practices of data-driven evaluation, behavioral change, integral mission, and community development. The Vision of a Healthy Village recognizes that safe water is not the only, or even the most important, component to healthy people and thriving villages. A Healthy Village is full (90% or more) of certified Healthy Homes. Lifewater staff train local health promoters to work with each household in a village on five main components: keeping water safe, using a safe latrine, using handwashing devices, using a dish drying rack, and keeping the home compound clean. When a household demonstrates these five behaviors, they can be certified. Healthy Homes are only one facet of a Healthy Village. The VHV strategy’s strength is in the effective engagement of all the stakeholders in the village. Lifewater works with the local school to help it get safe water and enough latrines and handwashing stations for all the students, including those with disabilities. The school also establishes a WASH Club, where student leaders teach their peers on the importance of good hygiene. In addition to training local health promoters, Lifewater helps set up a local water committee to manage and maintain the safe water point. You can find out more on the importance of water committees here. Healthy Villages also engage the local faith community. Lifewater staff and health promoters spend so much time working alongside communities (we typically spend three years in regular work and conversation, and several years after checking in on progress) that doors open to experience the local church ministering among its community. A Healthy Village collaborates with the local government to ensure long-term support and creating an environment where villages can thrive. By collaborating with the local government in all its projects, Lifewater helps strengthen local capacity, avoids waste, and advocates for the unreached and underserved. The Uganda government’s affirmation of the Vision of a Healthy Village reinforces our core belief about what makes lasting change possible. It all starts with people. As Christians, we believe God created each of us in His image, no matter where we’re born. When people know they are loved by God and are equipped for success, it transforms an entire community in a deep, lasting way.